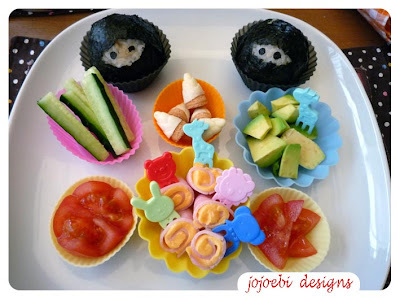 What is a MTD (muffin tin dinner/meal)? 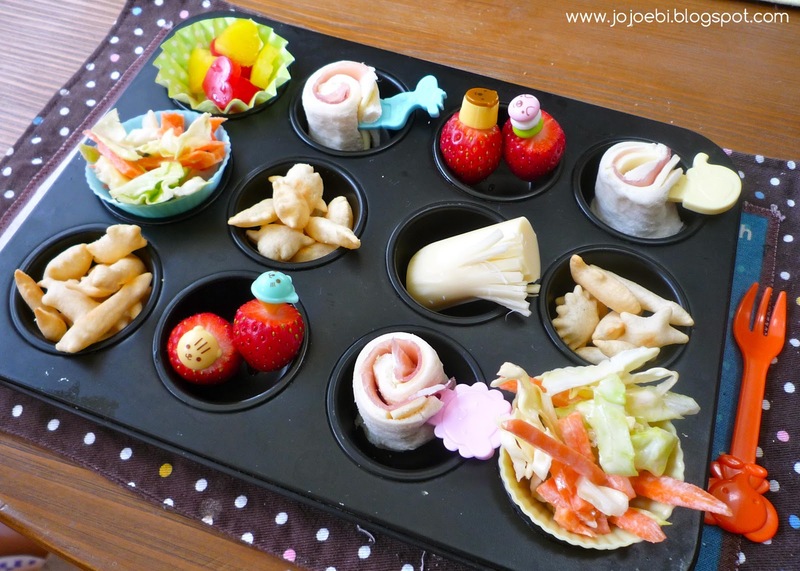 well, it is a meal served up in a muffin tin or in muffin silicon liners, we have been doing these for years now and Ebi-kun never gets bored of them. Recently though he has started eating dinner a bit later, we have been eating together so I haven't been making them as often. it is a great way to use up leftovers or little bits and bobs in the fridge and it doesn't matter if it is foods that you wouldn't normally put together. it is a super easy way to produce a balanced meal. 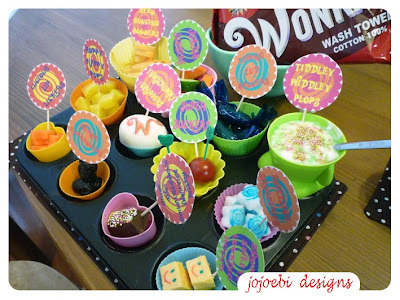 it is quick and easy (usually) and perfect if you have guests or children that all like different things. I can do food experiments like trying different foods together to see if they taste good or bad. I like guessing what the theme is when you make a cool MTD. Inspired yet or have I put you off? 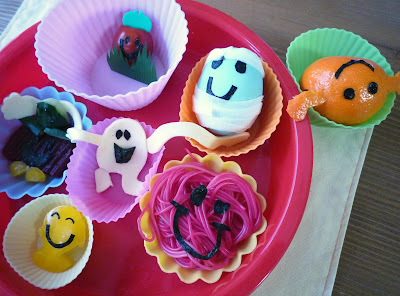 If you want to see what others do with their MTD's then pop over to the Muffin Tin Mom, she has a linky every Monday. some of them take quite a bit of faffying around, i usually have a sketch or plan of what I want to do though which helps.The Christmas one didn't take long at all, most of it was done using cookie cutters the wonker one did take me a while because I made all the picks too. We don't have a themed tin that often and I try to pick a day when i know I won't be rushed. Those are great looking meals! I also loved reading your son's reasons that he likes them! I was quite surprised with some of his answers! 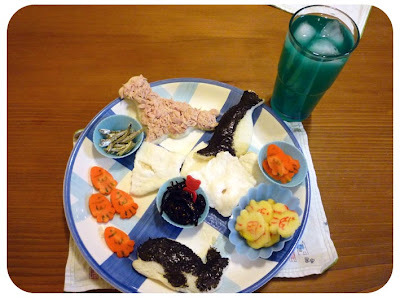 I love your themed meals! Antartica and Christmas are my favorites. Thanks for sharing. Antarctica is one of my favourites, I think because it was such a challenge! How did I miss that Mr Men tin?? It's awesome! 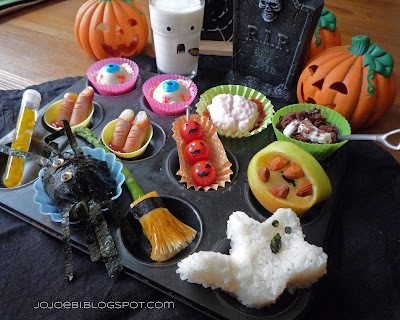 I loved reading Ebi-kun's reasons for liking Muffin Tin Meals - makes me want to ask The Muffin for her reasons! you should! ebi-kun thinks it is great he is allowed to eat his dessert first if he wants to! These look amazing, such a good idea. Particularly like your ninjas!